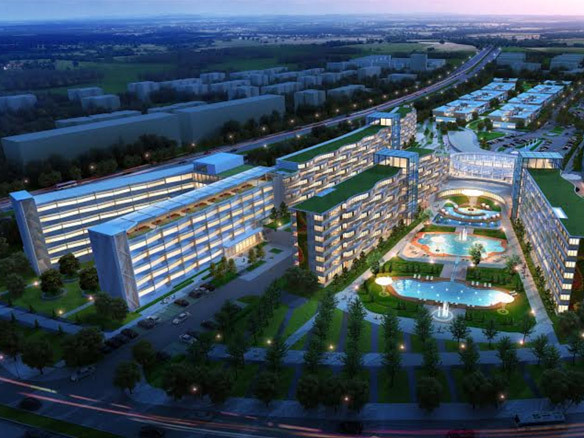 Cordogan, Clark & Associates, teamed with The Davis Experience of Phoenix, was one of three firms invited to enter an international competition for the design of a new Continuous Care Retirement Community (CCRC) on Chongming Island. Our project for the new CITIC Chongming Island CCRC is a state-of- the- art retirement community that integrates international "best practices" in a spectacular resort-style setting. It is designed in harmony with its unique Chongming Island setting. The building structures are low to the south, and gently slope upwards towards the north end of the site. This creates an architectural massing reminiscent of an Italian hilltown. The architectural style is unique: Elegant, Concise, and Exquisite. It is designed to capture the excitement of its location on the world-class ecological Chongming Island, and its proximity to downtown Shanghai. As such, it creates its own style, very contemporary yet not specifically western or eastern. It is designed to blend with nature while creating a stunning effect. The diversified architectural design enlivens the landscape, creating special places, avoiding monotony, allowing seniors to easily identify their special residences. The design is evolutionary. Having researched CCRC best practices, this design goes beyond them in evolving a new CCRC community. It creates a special new ecological type of CCRC development that is uniquely suited to Chongming, but will also be emulated elsewhere. It is designed to create a "sense of place": To create a place where people want to live. A series of courtyards, sunken gardens, ponds, and planted mounds creates a circulatory system that regulates and redistributes stormwater throughout the site. In areas where pavement is required, permeable materials such as local river stones, gravel, open-joint stone pavers, grass-crete, and compressed sand pavers are used to absorb water and naturally filter it. To reduce dependence on conventional energy sources, an optional 15,000 square feet of photovoltaic panels may be installed on the main multi-use building's roof. These solar cells could provide 12.5 percent of the headquarters' total electricity needs.